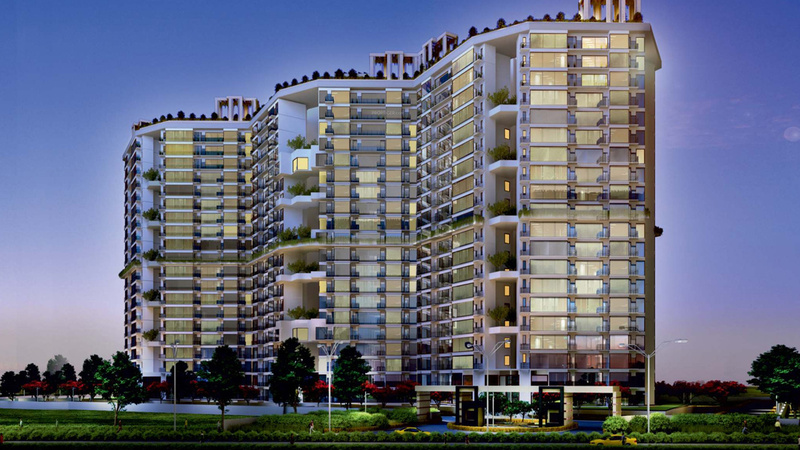 Gurgaon is a vibrant city and a part of the National Capital Region that has a lot to offer its inhabitants. In fact, people pick Gurgaon amongst the other parts of the NCR for plenty of reasons that include fabulous infrastructure, workspaces, residencies, public utilities and an environment filled with excitement. The real estate market in Gurgaon has come a long way over the years and has a lot to offer today. 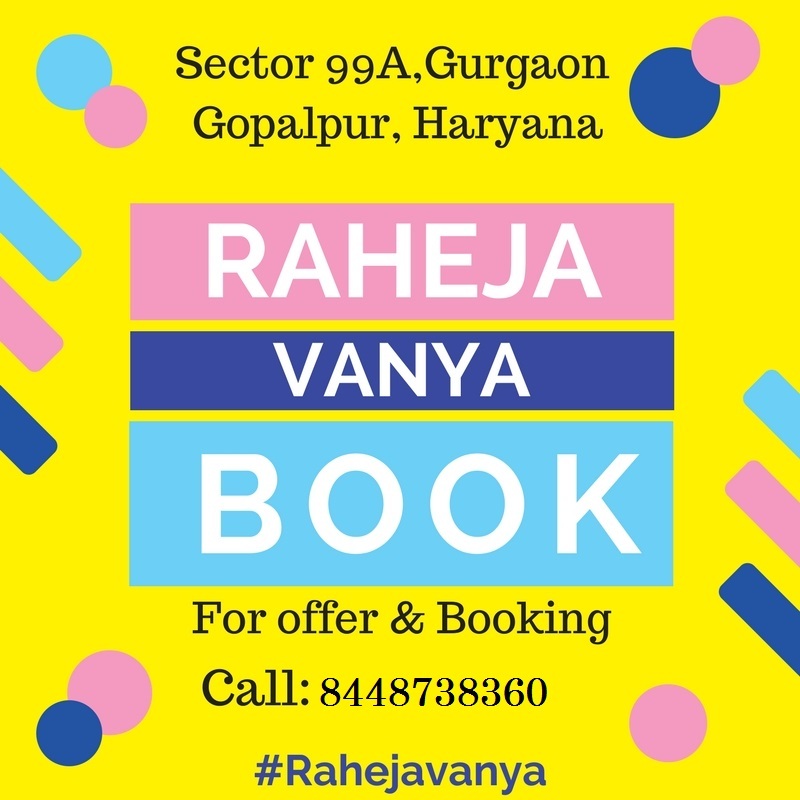 Raheja Vanya Gurgaon is a new residential project in Gurgaon by Raheja Group that is well-endowed with sophisticated features that are simply surreal. Extended over 12.4 acres of land, this development contains supreme structures that offer 2,3,4 & 5 BHK apartments of different configurations and area sizes starting at 1252 sq. ft. and going up to 3358 sq. ft. Welcome to a world of pure leisure and luxury space that you will never run short of! It is a divine residential development that offers the highest range of internal and external amenities for a modern-day lifestyle you will be proud to live. The apartments are spacious, air-conditioned, provide beautiful natural lighting, ventilation and contain luxury fittings and furnishings, elegant modular kitchens, high-quality flooring, premium doors and windows providing beautiful landscape views, recycled water used for flushing, top-notch safety features and so much more. This development offers distinct external features that are world class and will always keep you relaxed and happy each day. They include a clubhouse, swimming pool, multiple sports facilities and a play area for your kids, meditation centre, gymnasium, sauna, spa, sky jogging track and lounge, theatre, multipurpose hall, restaurant, landscaped garden, wide open space, power back-up for emergencies, rooftop solar power generator and high-end security with video surveillance for total safety. This development also takes-up sewage treatment and rainwater harvesting to help the environment. 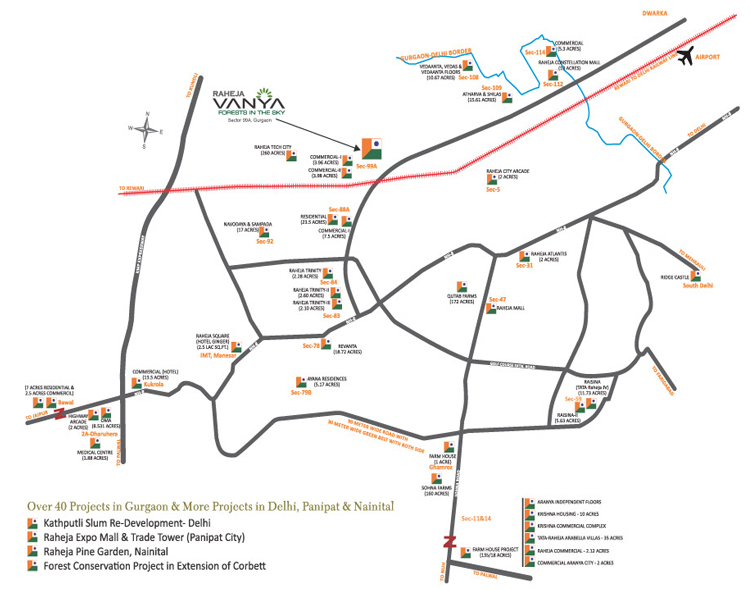 Situated at Sector 99A in Gurgaon, Raheja Vanya Sector 99A comes in close proximity to a number of your everyday and emergency places like schools, colleges, medical centres, hospitals, malls, shopping centres, convenience stores, supermarkets, cafes, restaurants, banks, ATMs, public transport and a lot more that you can access without any hassles and in the shortest amount of time possible.. Starting at Rs 53.52 lakhs. 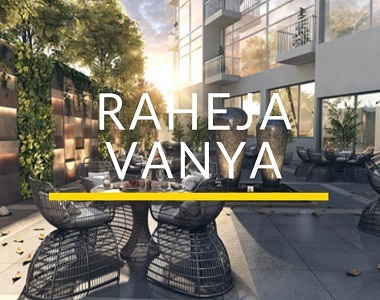 the Raheja Vanya price List is affordable and definitely worth the fabulous features that it has to offer. May it be a new home or an investment, an apartment at this development will not let you down and that is for sure. 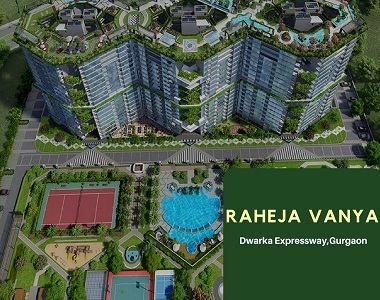 Within the larger project Raheja Vanya, there are several towers, out of which there is one by the name of Raheja Vanya Palash tower that offers lavish apartments with premium facilities for a lifestyle of pure divinity. The Project is filled with luxury and crafted to perfection. One look at this development and you will fall in love with it. This development contains a supreme tower that offers 2BHK luxury apartments of different configurations that contain world-class amenities for a rich lifestyle each day. The apartments are air-conditioned, beautiful and contain branded fittings, modular kitchens, high-quality electrical ports located perfectly for convenient access and more. Raheja Palash Tower does not fall short on its external amenities and offers only the best. From one of the largest clubhouses in the country to sky parks and entertainment zones, there is something for you and every member of your family. Located at Sector 99A, this development has plenty of landmarks in its vicinity and provides a total convenience that you will truly appreciate. And, Palash Tower offers residential units at prices that are totally affordable and worth every rupee. Choose from multiple payment plans along with home loan facilities, NRI services and more for convenient purchase. Book your apartment today and enter a new world of divine luxury!